And they did. The USA, Russia, China, Britain, France and Germany — practically the whole world — commanded Iran to start negotiations. All Israelis agree that the one supreme asset Israel has is its special, unparalleled relationship with the United States. It is unique. Unique and priceless. In military terms, Israel gets the most up-to-date weapon systems, practically for nothing. No less important, Israel can not conduct any war for more than a few days without an airlift of munitions and spare parts from the United States. And then there is the veto. Not the little veto Obama will use to neutralize a Congress vote against the agreement, but the Big Veto, the one that blocks every single UN Security Council resolution to censure Israel, even for actions that cry to high heaven. A 49-year-old occupation. Hundreds of thousands of settlers who contravene international law. Almost daily killings. Condemn Israel? Forget it. Sanctions against Israel? Don’t make us laugh. As long as the almighty United States protects Israel, It can do whatever it wants. Another hidden crack is the rift between Israel and a large part of the Jews around the world, especially in the USA. Israel claims to be the “Nation-State of the Jewish People.” All Jews throughout the world owe it unquestioning allegiance. A mighty apparatus of “Jewish organizations” is policing the vassals. Woe to the Jew who dares to object. What is happening now is a political earthquake. The landscape is changing dramatically. Mountains disappear, new ones are formed. The Shiite axis, from Iran, through Iraq and Syria, to Hezbollah in Lebanon is overtaking the Sunni bloc of Saudi Arabia and the Gulf States. Libya and Yemen are tossed around, Egypt harkens back to its glorious Pharaonic past, and in the middle of it all, a new power is raising its head — the Islamic Caliphate of Daesh, which attracts Muslim youth from all over the world. The United States and the other Western powers are cautiously changing their stance. They are afraid of Daesh, as they should be. They perceive that their interests are getting closer to those of Iran and further away from those of Saudi Arabia. The new nuclear agreement fits well into this pattern. 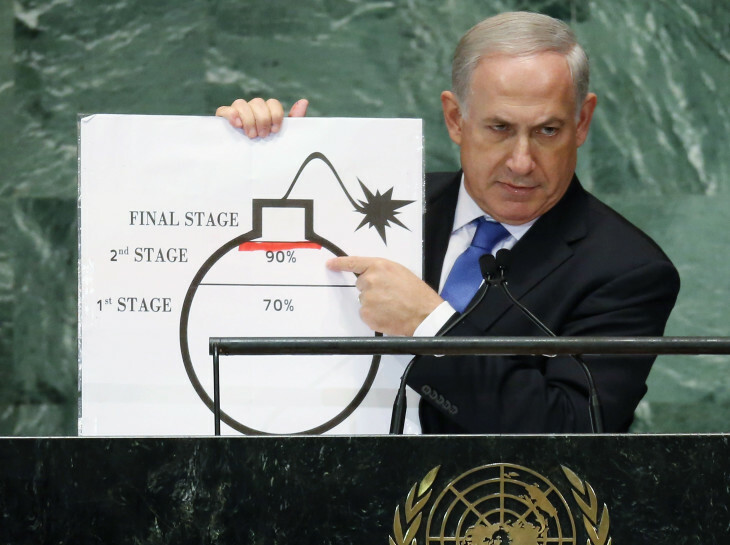 Netanyahu’s permanent trouble-making does not. So is the man shrewd or just foolish? A sorceror or just a sorceror’s apprentice?